WASHINGTON, May 23 (Xinhua) -- Chinese State Councilor and Foreign Minister Wang Yi said here on Wednesday that Washington should abide by its commitment to the one-China policy. 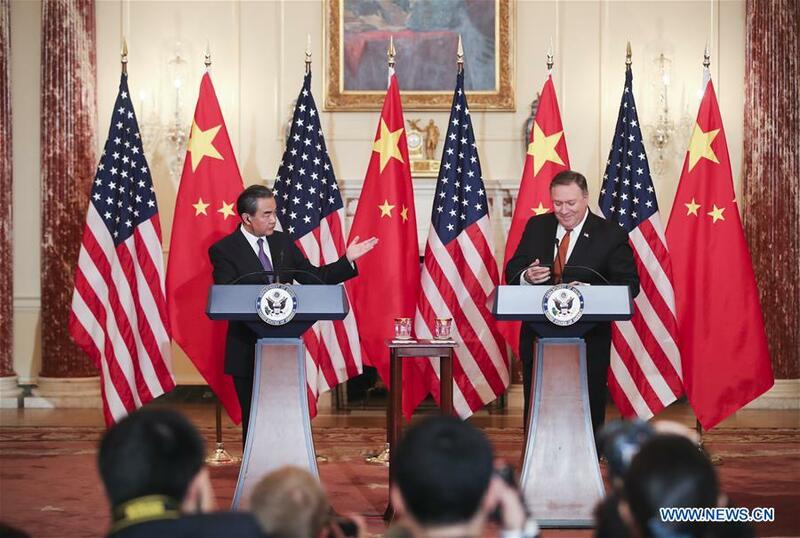 Wang made the remarks while speaking at a press conference with U.S. Secretary of State Mike Pompeo after their meeting. Wang noted that the Taiwan issue concerns China's sovereignty and territorial integrity, as well as China's core interests. For his part, Pompeo said the United States' one-China policy remains unchanged and the U.S. policy on this issue is consistent, when asked by a reporter whether there are changes to the one-China policy as the U.S. side has taken a series of negative acts on the Taiwan issue recently. Wang said the reporter's question reveals doubts of the Chinese society on the U.S. policy on the Taiwan issue. Wang said he noticed that Pompeo has clearly said there is no change to the one-China policy. China urges the U.S. side to stick to the one-China principle and the stipulations in the three Joint Communiques, and prudently and properly handle Taiwan-related issues, so as to preserve the overall interests of China-U.S. relations and peace and stability across the Taiwan Strait.